One of the riskiest sectors also offers some of the most lucrative opportunities. Here is what you need to know about the tech sector. Technology stocks are often some of the most closely followed publicly traded companies. This seems to be true in the media and on the Street. But it's the very same reasons this sector is often so "hot" that many investors, including famed investor Warren Buffett, choose to avoid it. Here is what you need to know about tech stocks. Surface Pro 3. Microsoft is often viewed as the prime example of a tech stock. Two of its longest standing businesses include the Windows operating system and the Microsoft Office suite. More recently, Microsoft has entered the business of selling its own mobile hardware, such as the Surface. But due to the fast-changing environment of technology stocks, there is little faith on the Street that Microsoft can suddenly become a major player in the new business. Making predictions for almost any technology isn't easy -- especially in fiercely competitive areas like consumer electronics. Source: Microsoft. Defining the tech sector isn't black and white. The stocks you'll find listed as tech stocks are in a varying range of subsectors, from capital-intensive business models like computer manufacturing to online platform businesses like digital advertising. Instead of trying to encapsulate them all in one definition, tech stocks may be best identified by their most prevalent commonality: rapid change. Some tech companies are in the business of creating or designing technology of some sort. Others research or market it. Common subsectors beyond the two already listed include semiconductors, online and cloud services, and information technology services. Generally, tech stocks trade with more volatility than other sectors, especially sectors with more predictable businesses like consumer staples, utilities, and financials. The reason for the volatility, of course, is that the prospects for any given tech company change just as rapidly as the underlying technology that drives its business. Further, fast-changing technology enables new entrants to spring from nowhere in very little time. This rapidly changing environment is what keeps Buffett mostly away from the sector. Since Buffett's investment strategy relies heavily on looking for companies with products and business models that are predictable as far as 15 to 20 years out, he usually avoids tech stocks, choosing instead to look for businesses that are easier to understand. 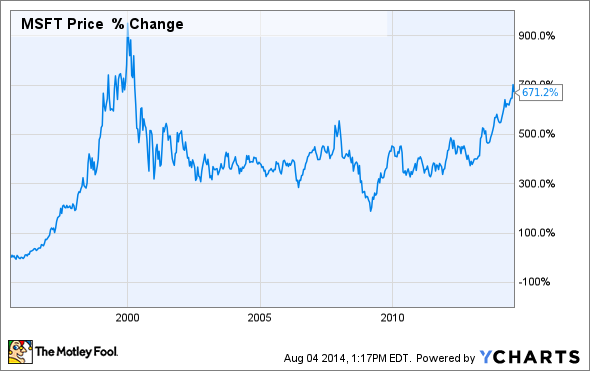 What is the history of tech stocks? Historically, technology stocks have underperformed other sectors. Between 1963 and 2013, tech stocks have earned an average annual return of 9.75%. This return puts the sector behind every other major sector, and earning meaningfully less than the best-performing sector, consumer staples, with a 13.33% average annualized return during the same period. Technology stocks, particularly those related to Internet stocks, were some of the large drivers behind the dot-com bubble in the late 1990s that drove some stocks to wild and irrationally optimistic valuations. The stock still hasn't recovered to the wild days of the late 90s and year 2000, yet the company is earning far more money today than it was then. How many tech stocks are there? According to the NASDAQ database, which includes stocks listed on the NYSE and the AMEX, there are 683 publicly traded technology companies. Among the 12 major sectors listed by the NASDAQ, the tech sector is the third largest, behind finance and consumer services. As of today, here is the breakdown of tech stocks by market capitalization. Why invest in tech stocks? Given the greater volatility of tech stocks, the most obvious reason to invest in this sector would be to seek out greater returns in a shorter period of time. This, however, isn't easy. First of all, it's important to keep in mind that tech stocks as a basket have underperformed all other major sectors since 1963 -- so you'll probably want to pick individual tech stocks if you venture into this fun but volatile sector. Second, identifying the right stocks in a very fast-changing environment likely means investors will have to put more time into both initial due diligence and into keeping an eye on their tech stock holdings. But if there are stocks you think you can understand, you could be well rewarded by identifying undervalued long-term holdings with sustainable characteristics. Further, for those who do choose to sift through tech companies for opportunities, there will likely always be ones that are ready to continue to grow rapidly and lucratively for years. However, finding these potential winners -- as well as identifying the ones that don't already have all this growth priced in -- is not an easy task. Tread carefully!